Chloe Grove is a british artist based in berlin. Her work depicts digital portrait photographs which are manually distorted to produce geometric caricatures. 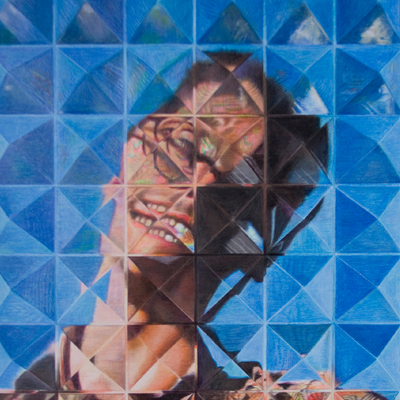 the refracted manipulation of the images and repetition of features highlight grotesque or sinister aspects of these faceted images of the human face. Source images have been hand-rendered in coloured pencil on paper at varying scale with emphasis on the digital, processed, screen-like quality adding to the fractured portrait a notion of digital image as precious keepsake, re-rendered in the tangible world. The drawings are an attempt to explore a reactive approach to the infinite reproducibility of the digital image, an enthusiasm for the unique and cynicism about the technological progressions of the future. 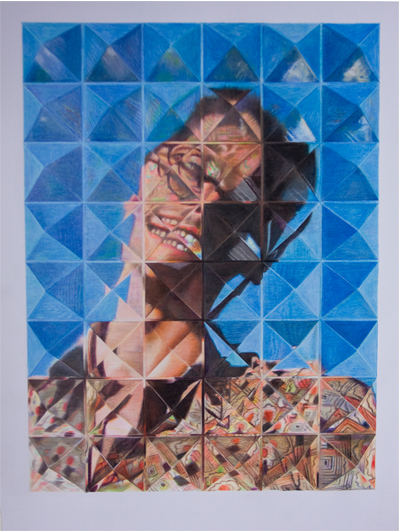 This exhibition includes a series of portraits ‘how the mighty have fallen’ featuring fractured, distorted images of icons from the public eye and two larger scale drawings.